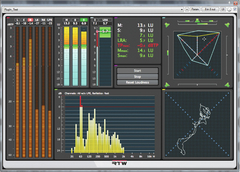 FRANKFURT, APRIL 16, 2015 — RTW, the market leader in visual audio meters and monitoring devices, is presenting its new Mastering Tools plug-in for loudness, level, audio analysis and mono-to-7.1 measurement at Musikmesse 2015 (Hall 5, Stand 1.A87). The second plug-in in RTW’s Masterclass PlugIns series of software-based metering solutions, the Mastering Tools are ideal for music, radio and audio/video producers and engineers. Designed for simple, intuitive operation by a broader user base, the new Mastering Tools plug-in brings extensive analysis and display functions for mastering, metering and loudness measurement for single- and up to eight-channel applications. Available as a standard-format plug-in for Windows and Mac OS platforms, it also offers a wide range of PPM scales, displays and TruePPM measurements. The RTW Masterclass Mastering Tools plug-in is part of the company’s continued efforts to provide access to high-quality audio metering and measurement to a wider range of customers. As such, it supports leading global loudness standards, including ITU BS.1770-3/1771-1, ATSC A/85, EBU R128, ARIB, OP-59, AGICOM and CALM Act. Other key features include numerical or bar graph-type readout, MagicLRA and correlator display, audio vectorscope, RTA (Real Time Analyzer), SSA (Surround Sound Analyzer) and multi-correlator. For added convenience, users can choose from up to six selectable window frame sizes and multiple instances.